We each behave differently online than we do in person, this is just something which happens naturally for most of us. There are part of yourself you expose online, and some parts you might keep more secretive. This isn’t a bad thing, it is just the way most people feel comfortable sharing themselves or keeping things quieter. 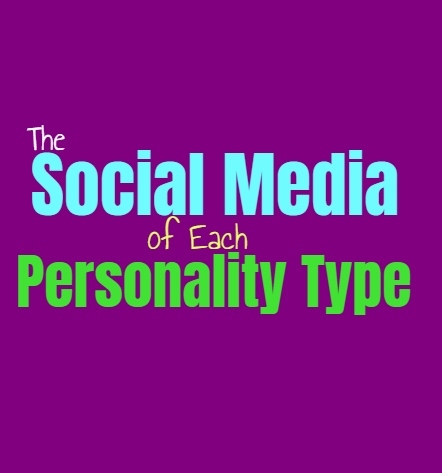 Here is what your social media presence is like, based on your personality type. INFJs how often a more prominent social media presence than people would expect from them. They feel safer sharing the things they are passionate about, and enjoy not feeling a sense of judgment from this. INFJs might be more private about their nerdy or unusual passions, but when they are online they can connect with people who share these hobbies and interests. For them it is rewarding to have a safe place and people they can be more open with without a fear of their reactions. INFJs are often more capable of being outgoing than people realize, but online they feel like drained by interacting and so their social media presence can often seem humorous and very open. ENFJs are naturally social individuals who enjoy being able to get to know new people and connect with them. Outside of social media they care about tending to the needs of others and work hard to make them proud. The ENFJ might enjoy sharing their darker side online, especially on social media accounts that their loved ones don’t know about. For the ENFJ it is about feeling safe to expose these parts of themselves without burdening the people closest to them. Their social media presence becomes more about the desires of the ENFJ, and less about being the perfectionist always caring for others. INFPs online are often much more open and can socialize for long periods of time without feeling drained. The option to just leave the conversation without needing to feel guilty about it, is very rewarding for them. Online the INFP often feels safer letting go of the things they often keep to themselves in the “real world”. For them it is about finding people who share similar interests and being free to let their freak flag fly. INFPs are always open and sincere, but social media often provides a place for them to be themselves without feeling judged or misunderstood. They can find people who are similar to them and who can connect with them on a different level. ENFPs are often more present in their day to day lives, but that doesn’t mean social media can’t provide something unique for them. ENFPs often care much less what people think of them online, and enjoy being able to push the limits. They can express themselves without feeling like they need to be careful, and at the same time they don’t feel pressure to respond immediately. ENFPs have so much on their minds, and so sometimes social media gives them the time to process this before feeling obligated to respond to people. INTJs can actually be more conscious of what ehh say and do on social media because they realize the permanence of it. If they are using an account which can be connected to them, they want to be very careful how they express themselves. They are often business minded people and so they want to be conscious of this. On the other hand, INTJs might be different if they have a more anonymous social media presence, feeling more capable of being open and possibly pushing the boundaries of things they otherwise would not. ENTJs are often more argumentative when it comes to their social media presence. They are this way because they often see things online which frustrate them, and they feel the need to express their point of view. ENTJs are outgoing people naturally, but online they can often focus more on debating and proving their point in hopes of spreading their truth. ENTJs are also researching and so online they are likely to post a lot of articles and things they find valuable. While in real life people often see their playful side much more, since ENTJs are friendly people. INTPs are certainly more capable of appearing extroverted and outgoing when they are online. This is because they have the opportunities to remove themselves from a conversation when they feel drained, without feeling guilty over this. Oftentimes the INTP becomes exhausted by social interaction, and when they are physically around people it can be hard to make them understand why. When they are online INTPs feel more capable of stepping into social situations, since they are free to leave whenever they please and can easily come up with a reason why they had to. They often appear more playful and more social, which can be something they enjoy in this setting. ENTPs often have a similar social media presence to the one they have in real life, although online they can put up more walls. When it comes to being on social media the ENTP enjoys being social, but they also enjoy finding people they can debate with. When it comes to their real life presence they can be more sensitive to their loved ones, wanting to connect with them and not wanting to seem distant. When they are online ENTPs enjoy being able to appear a certain way, allowing their jesting side to really expose itself. ISTJs might not have a very prominent online presence, but when they do it can be more chatty and open than usual. When it comes to their day to day lives ISTJs are often very focused and often private people. When it comes to their online presence this can be a place to be a bit more social and talkative, since they feel a bit less drained by it. Some ISTJs feel more like lurking though and just enjoy researching and observing online. ESTJs often have a more debating online presence, since they find themselves getting annoyed by a lot of what they read. They will often find themselves working to prove people wrong and make their point very clear to those they discuss things with. For the ESTJ being online can sometimes feel like a waste of time, so they don’t want to have too prominent of an online presence. They can certainly be just as social online though, when they do spend time discussing things with people. ISFJs can certainly be more open online, and enjoy finding a place to express themselves better. When it comes to their day to day lives the ISFJ doesn’t like burdening their loved ones and so they keep a lot to themselves. Online they have an opportunity to really find people who will understand their interests and personal hobbies and won’t feel like they are being a burden. While ESFJs are often seen as social people, they can certainly keep parts of themselves quiet. They don’t like burdening others and can feel afraid to be open about their passions sometimes. Online the ESFJ is often more open and enjoys gaining friends and showing different parts of themselves. This is often where they can explore these passions and even find people to vent to without making themselves feel guilty over it. ISTPs aren’t often focused on building an online presence, since they are focused more on living in the physical world. They are in touch with their physical selves, and can feel a bit stagnant being online for too long. ISTPs can be a bit more outgoing online though, and enjoy debating topics and spreading the facts when they can. They also might have a side of themselves which likes to swoop in and defend people, especially when those people are correct about something. They enjoy being accurate and don’t like when they seem people being ignorant online. ESTPs often have an online presence which is more focused on facts and spreading information. They are very social people in their day to day lives, but might be less communicative online. ESTPs before to discuss things in person so that they can see the person in front of them. They do use social media to connect with friends when they aren’t together, but for them being in person is more rewarding. Their social media presence is more about information and correcting people who they see being ignorant. ISFPs might be just as timid online, unsure of where to open up. They might be more focused on things like sharing their art, and don’t really want to overwhelm people by being super open and chatty. They do find it easier to meet people this way though, and enjoy feeling less nervous about expressing themselves. ISFPs do like having in person connections though, since they are connected to their physical selves. For them social media is a place to find people who share similar interests, so that they can share their own creations. ESFPs are often more prominent in the physical world, not really knowing how to navigate social media without become antsy. They are more focused on living in the present moment and can become a bit drained with being online too much. ESFPs do enjoy connecting with people online though and will spend time chatting with friends and loved ones who are far away. ESFPs aren’t usually much different online than they are in person though, their presence being just as open and as friendly.